You see chokers everywhere- boisterous labs wheezing and gasping as they try to drag their owner around on a choker. At the vet clinic, the technicians usually ignore whatever collar or harness the dog came in on and slip a choker on the dog. In obedience classes, many trainers insist on the dogs wearing chokers made out of chain. Chokers are so common that many never stop to think: that device is intended to constrict and cut off the dog's airway. Surely that isn't a good idea? In people, putting things that tighten around the neck is a big no-no. We're warned as children against playing stupid games that involve things around the neck. Why? Because it's dangerous. Put a noose around someone's neck and tighten it. They start gasping, panicking and quickly lose consciousness. Shortly thereafter, they die. So why do we want to do this to our dogs? Oh, they are different somehow, many people claim. It doesn't hurt them to choke them. Well, actually it just might. One "dog farm" that raises St. Bernards for meat slaughters the dog by putting a choker on them and well, choking them until they die. Before you say that's a rather extreme example, there was a recent report in a newspaper about a young German Shepherd who died after being "disciplined" by his owners by hanging him off a choker- death by strangulation, the vets said. We don't know the actual numbers, but considering how many anecdotal reports you hear of dogs dying of strangulation after getting their collar hung up on something, it is clearly true that dogs do choke and die if you constrict their airway just like any other animal. We can't think of any other animal control device that is actually capable of easily killing the animal if used as directed. Large animals are usually controlled by head halters, bits or nose rings, which can cause physical damage if mis-used but are very unlikely to actually kill the animal. So why do we feel the need to strangle man's best friend? Oh, you say. But you're not supposed to let Fido actually pull into a choker and strangle himself, you're just supposed to intermittently choke him as a correction. It is true that chokers are supposed to be used only as a training device. In old-fashioned obedience training, you were supposed to use the choker to hit the dog with "collar pops" until Fluffy figured out what you wanted him to do. This kind of training is, unfortunately, still being used today. In a typical "heeling" exercise the confused dogs are marched around for lengthy periods of time and whenever they wander out of heel position the owner yanks really hard on the leash. 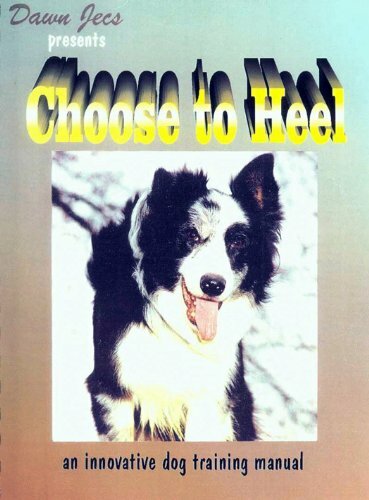 Thousands of yanks later Fluffy eventually figure out what "heel" means. So true, when used in this way the dog isn't actually being choked continuously, just intermittently and frequently. When you do a collar pop on a choker, the thin chain or nylon tightens very suddenly and digs painfully into the skin and muscles of the dog's neck, constricts the airway and temporarily stops the dog from breathing. The yank also violently pulls the dog's neck to one side. Dogs have been presented to vets with whiplash, sprained necks, and evidence of spinal cord damage in association with choke collar corrections. We'll discuss that more later. We think that collar-pops are one of the least effective training methods ever invented. However, if you disagree, it is certainly possible to do collar pops to a dog without using a collar capable of strangling the dog. You can pop your dog in a regular non-tightening buckle collar. If you don't think that's effective enough, there are also martingale-type collars. These collars only tighten so much and are very useful for keeping dogs from slipping out of collars. 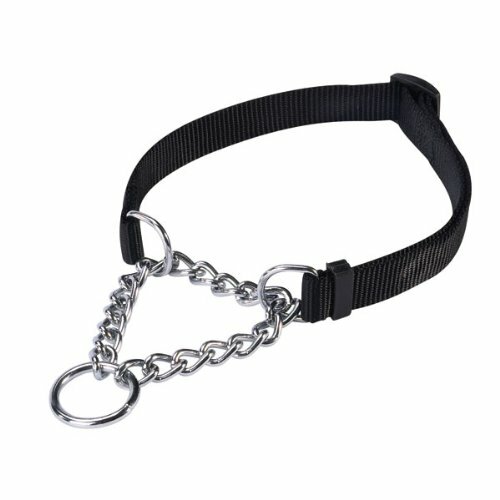 Martingale-type collars come in prong and chain forms that are quite capable of being used to deliver collar pops. Most trainers agree these collars are much safer than choke collars. Oddly enough prong collars are illegal in some countries and banned from many training clubs and competitions, but the much more dangerous chokers are widely accepted anywhere. You can even show your dog in some competitions wearing a choker collar. There are, however, many people who advocate strangling dogs as a training technique. The most commonly encountered method isn't, of course, referred to as strangling the dog. It's called a "dominant dog collar." A dominant dog collar is a choker, usually a thin nylon one, that the dog is supposed to wear all of the time. Whenever Fluffy gets really out of control, you're supposed to lift him up off his front feet by the choker and basically strangle him until he "calms down", aka starts to pass out from lack of oxygen. We suspect that the German shepherd so recently killed by strangulation was being subjected to this "training" technique- it seems to be particularly popular among German shepherd owners for some reason. Most of the animals we have seen being treated this way are actually leash-reactive dogs, not aggressive or "dominant" dogs, and strangling them like this is not very likely to help at all, even if they don't die or suffer brain damage from having their airway cut off repeatedly. The other strangulation method has, fortunately, fallen out of favor and isn't seen often today, although it was common in the past. It was originally advocated by Koehler and his ilk who seemed very fond of inflicting extremely brutal physical punishments on dogs in the name of "training." It has been called "the helicopter", or just what it is, "hanging." As a punishment the dog is hung off the choker, gasping and dying. In the "helicopter" the dog is actually swung in a circle by the neck, choking and dying. These methods are generally accepted as being blatant animal abuse by most people nowadays. Personally, we don't really see why hanging dogs off a choker called "a dominant dog collar" is any different than hanging a dog off a regular chain choker and feel that both are utterly inhumane. Which brings us to the most commonly-seen "dogs being strangled" scenario: the dog fitted with a choker who is allowed to pull on the leash and strangle himself. Since the dog is kind of doing this to himself it's less likely to be viewed as animal abuse. But we feel that it is just as much animal abuse. Dogs shouldn't be allowed to choke themselves- you know it's not good for your dog, and you're supposed to be the brains of the operation. You don't let your dog eat cooked chicken bones, run out into traffic, or drink anti-freeze, so why do you let him strangle himself? Giving himself brain damage from lack of oxygen is not very likely to improve his behavior. Chokers are pretty much completely useless for teaching dogs to not pull on the leash- dogs never seem to learn to not-pull if just allowed to pull into a choker. If anything, it teaches them to pull even harder. If your dog pulls into a choker in this way we urge you to ditch the choker and go about teaching your dog to not pull on the leash properly. A prong collar or a no-pull harness is a much safer, more effective way of controlling a dog if you feel the need to have some kind of control equipment on the dog. Before you say, but dogs hardly ever actually die from chokers! There are all kinds of troubling reports of dogs suffering severe damage from chokers, and yes, occasionally dying. A dissertation published in 2007 does a pretty good job of summarizing the evidence that chokers cause physical damage. It starts off by reviewing the evidence for damage from chokers- several scientific studies showing that dogs trained with collar corrections via a choker were often reported to have abnormalities and damage of the cervical spine. The rates were usually up in the 90% area- yeah, 90% of dogs trained with chokers had suffered damage to their necks and spines from chokers. The dissertation aims to address the question of whether chokers only cause damage if mis-used, or if they cause damage merely because of their design, even if used correctly. One study reported that untrained dog owners did cause a lot of damage to the neck of their pets with their attempts to do collar pops with a choker or by letting the pet pull into the choker and strangle itself. However, other studies of chokers handled by professional trainers reported that collar pops with a choker had caused severe neck sprains, foreleg paresis, hindlimb ataxia, Horner's syndrome, loss of voice and fainting. They even invented a name for one of the more common cervical spine damage conditions they saw- "woodhouse neck" in which the choke collar had damaged the neck vertebrae to such a degree that the damage was clearly visible on a neck x-ray. Additional reports of professional trainers causing whiplash, dislocated necks, and even death with chokers exist. The dissertation goes on to discuss the various kinds of pathology and damage commonly found in the necks of dogs trained with choke chains. It's pretty grim reading. The answer to the question is, yes, it's the design of chokers that is inherently damaging to dogs, not how they are used, that is the problem. It is unclear if dogs trained with collar-pops delivered via non-chokers also suffer from neck damage. It is clear that it's much harder to kill a dog with a non-choke collar. 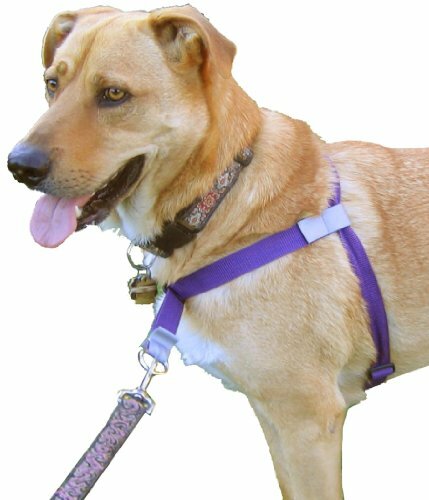 Prongs and martingales only tighten so much and don't actually compress the dog's neck even if yanked on very hard, therefore many of the compression-type and overt strangulation injuries caused by chokers won't occur. The yanking aspect of the correction is, however, capable of causing whiplash and other damage to the neck. One good aspect of a prong versus a choker is that users of prongs rarely yank anywhere near as violently or as frequently as choker users tend to do. And dogs who are experienced with a prong are very unlikely to lunge into or "choke" themselves while on a prong. Anita, Miles Pathologies of the Dog Associated with the Use of Choke Chains. European School of Animal Oseopathy, Dissertation: http://www.classiclinkltd.com/memoires/MM-0478.pdf, 2007.